For other uses, see Jacobin (disambiguation). The Society of the Friends of the Constitution (French: Société des amis de la Constitution), after 1792 renamed Society of the Jacobins, Friends of Freedom and Equality (Société des Jacobins, amis de la liberté et de l'égalité), commonly known as the Jacobin Club (Club des Jacobins) or simply the Jacobins (/ˈdʒækəbɪn/; French: [ʒakɔbɛ̃]), became the most influential political club during the French Revolution of 1789 and following. The period of their political ascendency is known as the Reign of Terror, during which time tens of thousands were put on trial and executed in France, many for political crimes. Today, the terms "Jacobin" and "Jacobinism" are used in a variety of senses. In Britain, where the term "Jacobin" has been linked primarily to the Mountain, it is sometimes used as a pejorative for radical left-wing revolutionary politics, especially when it exhibits dogmatism and violent repression. In France, "Jacobin" now generally indicates a supporter of a centralized republican state and of strong central government powers and/or supporters of extensive government intervention to transform society. It is also used[by whom?] in other related senses, indicating proponents of a state education system which strongly promotes and inculcates civic values and proponents of a strong nation-state capable of resisting any undesirable foreign interference. When the Estates General of 1789 in France was convened in May–June 1789 at the Palace of Versailles, the club, originated as the Club Breton, was composed exclusively of a group of Breton representatives attending those Estates General. They soon were joined by deputies from other regions throughout France. Among early members were the dominating comte de Mirabeau, Parisian deputy Abbé Sieyès, Dauphiné deputy Antoine Barnave, Jérôme Pétion, the Abbé Grégoire, Charles Lameth, Alexandre Lameth, Robespierre, the duc d'Aiguillon, and La Revellière-Lépeaux. At this time, meetings occurred in secret, and few traces remain concerning what took place or where the meetings were convened. By the March on Versailles in October 1789, the club, still entirely composed of deputies, reverted to being a provincial caucus for National Constituent Assembly deputies from Brittany. As of October 1789, the group rented for its meetings the refectory of the monastery of the Jacobins in the Rue Saint-Honoré, adjacent to the seat of the Assembly. The name Jacobins, given in France to the Dominicans (because their first house in Paris was in the Rue Saint-Jacques), was first applied to the club in ridicule by its enemies. 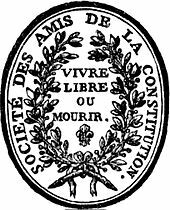 The club was re-founded in November 1789, after an address from the London Revolution Society congratulating the French on "conquering their liberty" led National Assembly deputies to found their own Société de la Révolution. Once in Paris, the club soon extended its membership to others besides deputies. All citizens were allowed to enter, and even foreigners were welcomed: the English writer Arthur Young joined the club in this manner on 18 January 1790. Jacobin Club meetings soon became a place for radical and rousing oratory that pushed for republicanism, widespread education, universal suffrage, separation of church and state, and other reforms. To discuss in advance questions to be decided by the National Assembly. To work for the establishment and strengthening of the constitution in accordance with the spirit of the preamble (that is, of respect for legally constituted authority and the Declaration of the Rights of Man and of the Citizen). At the same time the rules of order of election were settled, and the constitution of the club determined. There was to be a president, elected every month, four secretaries, a treasurer, and committees elected to superintend elections and presentations, the correspondence, and the administration of the club. Any member who by word or action showed that his principles were contrary to the constitution and the rights of man was to be expelled. By the 7th article the club decided to admit as associates similar societies in other parts of France and to maintain with them a regular correspondence. By 10 August 1790 there were already one hundred and fifty-two affiliated clubs; the attempts at counter-revolution led to a great increase of their number in the spring of 1791, and by the close of the year the Jacobins had a network of branches all over France. At the peak there were at least 7,000 chapters throughout France, with a membership estimated at a half-million or more. It was this widespread yet highly centralised organization that gave to the Jacobin Club great power. By early 1791, clubs like the Jacobins, the Club des Cordeliers and the Cercle Social were increasingly dominating French political life. Numbers of men were member of two or more of such clubs. Women were not accepted as members of the Jacobin Club (nor of most other clubs), but they were allowed to follow the discussions from the balconies. The rather high subscription of the Jacobin Club confined its membership to well-off men. The Jacobins claimed to speak on behalf of the people but were themselves not of 'the people': contemporaries saw the Jacobins as a club of the bourgeoisie. As far as the central society in Paris was concerned, it was composed almost entirely of professional men (such as the lawyer Robespierre) and well-to-do bourgeoisie (like the brewer Santerre). From the start, however, other elements were also present. Besides the teenage son of the Duc d'Orléans, Louis Philippe, a future king of France, liberal aristocrats such as the duc d'Aiguillon, the prince de Broglie, and the vicomte de Noailles, and the bourgeoisie formed the mass of the members. The club further included people like "père" Michel Gérard, a peasant proprietor from Tuel-en-Montgermont, in Brittany, whose rough common sense was admired as the oracle of popular wisdom, and whose countryman's waistcoat and plaited hair were later on to become the model for the Jacobin fashion. The Jacobin Club supported the monarchy up until the very eve of the republic (20 September 1792). They did not support the petition of 17 July 1791 for the king's dethronement, but instead published their own petition calling for replacement of king Louis XVI. The departure of the conservative members of the Jacobin Club to form their own Feuillants Club in July 1791 to some extent radicalized the Jacobin Club. Late 1791, a group of Jacobins in the Legislative Assembly advocated war with Prussia and Austria. Most prominent among them was Brissot, other members were Pierre Vergniaud, Fauchet, Maximin Isnard, Jean-Marie Roland. Maximilien Robespierre, also a Jacobin, strongly pleaded against war with Prussia and Austria – but in the Jacobin Club, not in the Assembly where he was not seated. Disdainfully, Robespierre addressed those Jacobin war promotors as 'the faction from the Gironde'; some, not all of them, were indeed from department Gironde. The Assembly in April 1792 finally decided for war, thus following the 'Girondin' line on it, but Robespierre's place among the Jacobins had now become much more prominent. The Legislative Assembly, governing France from October 1791 until September 1792, was dominated by men like Brissot, Isnard and Roland: Girondins. But after June 1792, Girondins visited less and less the Jacobin Club, where Robespierre, their fierce opponent, grew more and more dominant. 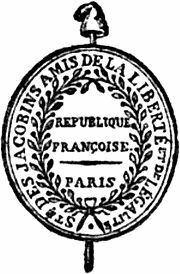 On 21 September 1792, after the fall of the monarchy the title assumed by the Jacobin Club after the promulgation of the constitution of 1791 (Société des amis de la constitution séants aux Jacobins à Paris) was changed to Société des Jacobins, amis de la liberté et de l'égalité (Society of the Jacobins, Friends of Freedom and Equality). In the newly elected National Convention, governing France as of 21 September 1792, Maximilien Robespierre made his comeback in the center of French power. Together with his 25-year-old protégé Louis Antoine de Saint-Just, Marat, Danton and other associates they took places on the left side on the highest seats of the session room: therefore that group around and led by Robespierre was called The Mountain (French: la Montagne, les Montagnards). On 6 April 1793, the Convention established the Comité de salut public (Committee of Public Prosperity, also translated as Committee of Public Safety) as sort of executive government of nine, later twelve members, always accountable to the National Convention. Initially, it counted no Girondins and only one or two Montagnards, but gradually the influence of Montagnards in the Committee grew. Early April 1793, Minister of War Pache said to the National Convention that the 22 leaders of the Girondins should be banned. Later that month, the Girondin Guadet accused the Montagnard Marat of 'preaching plunder and murder' and trying 'to destroy the sovereignty of the people'. A majority of the Convention agreed to put Marat on trial, but the court of justice quickly acquitted Marat. This apparent victory of the Montagnards intensified their antipathies of the Girondins, and more proposals were vented to get rid of the Girondins. On 2 June 1793, the Convention was besieged in its Tuileries Palace by a crowd of around 80,000 armed soldiers, clamorously on the hand of the Montagnards. In a chaotic session a decree was adopted that day by the Convention, expelling 22 leading Girondins from the Convention, including Lanjuinais, Isnard and Fauchet. Around June 1793, Maximilien Robespierre and some of his associates (Montagnards) gained greater power in France. Many of them, like Robespierre himself, were Jacobin: Fouché, Collot d'Herbois, Billaud-Varenne, Marat, Danton, Saint-Just. Three other powerful Montagnards were not known as Jacobin: Barère, Hébert and Couthon. In 'culture wars' and history writing after 1793 however, the group around Robespierre dominating French politics in June 1793–July 1794 was often designated as 'Jacobins'. Many of these Montagnards (and Jacobins) entered, or were already, in the de facto executive government of France, the Committee of Public Prosperity (or Public Safety): Barère was in it since April 1793 until at least October 93, Danton served there from April until July 1793, Couthon and Saint-Just had entered the Committee in May, Robespierre entered it in July, Collot d'Herbois in September and Billaud-Varenne also around September 1793. Robespierre for his steadfast adherence to and defence of his views received the nickname and reputation of l'Incorruptible (The Incorruptible or The Unassailable). Several deposed Girondin-Jacobin Convention deputies, among them Jean-Marie Roland, Brissot, Pétion, Louvet, Buzot and Guadet, left Paris to help organize revolts in more than 60 of the 83 departments against the politicians and Parisians, mainly Montagnards, that had seized power over the Republic. The government in Paris called such revolts 'federalist' which was not accurate: most did not strive for regional autonomy but for a different central government. In October 1793, 21 former Girondin Convention deputies were sentenced to death for supporting an insurrection in Caen. In March 1794, the Montagnard Hébert and some followers were sentenced to death; in April the Montagnard Danton and 13 of his followers were sentenced to death; in both cases after insinuation by Robespierre in the Convention that those "internal enemies" were promoting 'the triumph of tyranny'. Meanwhile, the Montagnard-dominated government resorted also to harsh measures to repress what they considered counter-revolution, conspiracy and "enemies of freedom" in the provinces outside Paris, resulting in 17,000 death sentences between September 1793 and July 1794 in all of France. In late June 1794, three colleagues on the Committee of Public Prosperity/Safety – Billaud-Varenne, Collot d'Herbois and Carnot – called Robespierre a dictator. Late July 1794, Robespierre and 21 associates including the Jacobin Saint-Just and the Montagnard Couthon were sentenced to death by the National Convention and guillotined. Probably because of the high level of repressive violence – but also to discredit Robespierre and associates as sole responsibles for it – historians have taken up the habit to roughly label the period June 1793–July 1794 as 'Reign of Terror'. Later and modern scholars explain that high level of repressive violence with: France was menaced by civil war and by a coalition of foreign hostile powers, requiring the discipline of the Terror to mold France into a united Republic capable of resisting this double peril. With Robespierre and other leading Montagnards and Jacobins being executed in July 1794, Montagnards and Girondins as groups seem to have ceased to play a significant role in French history: historians make no more mention of them. Also the Jacobin Club seems not to have played a decisive role any longer. On 9 thermidor Year II (27 July 1794), at some time in the evening, Louis Legendre was sent out to close the Jacobins club which gathered every Saturday evening. The Jacobin club was finally disbanded on 12 November 1794. An attempt to reorganize Jacobin adherents was the foundation of the Réunion d'amis de l'égalité et de la liberté, in July 1799, which had its headquarters in the Salle du Manège of the Tuileries, and was thus known as the Club du Manège. It was patronized by Barras, and some two hundred and fifty members of the two councils of the legislature were enrolled as members, including many notable ex-Jacobins. It published a newspaper called the Journal des Libres, proclaimed the apotheosis of Robespierre and Babeuf, and attacked the Directory as a royauté pentarchique. But public opinion was now preponderatingly moderate or royalist, and the club was violently attacked in the press and in the streets. The suspicions of the government were aroused; it had to change its meeting-place from the Tuileries to the church of the Jacobins (Temple of Peace) in the Rue du Bac, and in August it was suppressed, after barely a month's existence. Its members avenged themselves on the Directory by supporting Napoleon Bonaparte. The Jacobin movement encouraged sentiments of patriotism and liberty amongst the populace. The movement's contemporaries, such as the King Louis XVI, located the effectiveness of the revolutionary movement not "in the force and bayonets of soldiers, guns, cannons and shells but by the marks of political power". Ultimately, the Jacobins were to control several key political bodies, in particular the Committee of Public Safety and, through it, the National Convention, which was not only a legislature but also took upon itself executive and judicial functions. The Jacobins as a political force were seen as "less selfish, more patriotic, and more sympathetic to the Paris Populace." This gave them a position of charismatic authority that was effective in generating and harnessing public pressure, generating and satisfying sans-culotte pleas for personal freedom and social progress. The Jacobin Club developed into a bureau for French republicanism and revolutionary purity, and abandoned its original laissez faire economic views in favor of interventionism. In power, they completed the abolition of feudalism that had been formally decided 4 August 1789, but had been held in check by a clause requiring compensation for the abrogation of the feudal privileges. Maximilien Robespierre entered the political arena at the very beginning of the Revolution, having been elected to represent Artois at the Estates General. Robespierre was viewed as the quintessential political force of the Jacobin Movement, thrusting ever deeper the dagger of liberty within the despotism of the Monarchy. As a disciple of Rousseau, Robespierre's political views were rooted in Rousseau's notion of the social contract, which promoted "the rights of man". Robespierre particularly favored the rights of the broader population to eat, for example, over the rights of individual merchants. "I denounce the assassins of the people to you and you respond, 'let them act as they will.' In such a system, all is against society; all favors the grain merchants." Robespierre famously elaborated this conception in his speech on 2 December 1792: "What is the first goal of society? To maintain the imprescribable rights of man. What is the first of these rights? The right to exist." The meeting place of the Fraternal Society of Patriots of Both Sexes was an old library room of the convent which hosted the Jacobins, and it was suggested that the Fraternal Society grew out of the regular occupants of a special gallery allotted to women at the Jacobin Club. The cultural influence of the Jacobin movement during the French Revolution revolved around the creation of the Citizen. As commented in Jean-Jacques Rousseau's 1762 book The Social Contract, "Citizenship is the expression of a sublime reciprocity between individual and General will." This view of citizenship and the General Will, once empowered, could simultaneously embrace the Declaration of the Rights of Man and of the Citizen and adopt the liberal French Constitution of 1793, then immediately suspend that constitution and all ordinary legality and institute Revolutionary Tribunals that did not grant a presumption of innocence. The Jacobins were foes of both the Church and of atheism. They set up a new religious cult to replace Catholicism. They advocated deliberate government-organized terror as a substitute for both the rule of law and the more arbitrary terror of mob violence, inheritors of a war that, at the time of their rise to power, threatened the very existence of the Revolution. Once in power the Jacobins completed the overthrow of the Ancien Régime and successfully defended the Revolution from military defeat. However, to do so, they brought the Revolution to its bloodiest phase, and the one with least regard for just treatment of individuals. They consolidated republicanism in France and contributed greatly to the secularism and the sense of nationhood that have marked all French republican regimes to this day. However, their ruthless and unjudicial methods discredited the Revolution in the eyes of many. The resulting Thermidorian Reaction shuttered all of the Jacobin clubs, removed all Jacobins from power, and condemned many, well beyond the ranks of the Mountain, to death or exile. 1790 – Honoré Gabriel Riqueti, comte de Mirabeau, Dubois-Crancé; Maximilien Robespierre; End of March-3 June 1790. ^ See also: Jordan, David P. (2013). The Revolutionary Career of Maximilien Robespierre. New York: Simon and Schuster. ISBN 9781476725710. Retrieved 17 February 2019. [Robespierre] was always more comfortable at the Jacobin Club than standing before the National Assembly. Not only had the Jacobins been formed in his own image, but he was assured of a sympathetic hearing before his friends. Robespierre had been a member of the Jacobins from its earliest Versailles days when it began inconspicuously as a gathering of deputies from the province of Brittany, along with some other interested adherents [...]. 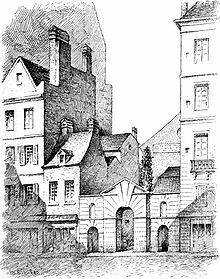 The group did not acquire its famous nickname, the Jacobins, until it rented an abandoned Dominican monastery, in the rue Saint-Honoré in Paris, whose monks had been known as Jacobins and whose building also shared the name. ^ a b c Brinton, Crane (2011) . The Jacobins: An Essay in the New History. Transaction Publishers. p. xix. ISBN 9781412848107. Retrieved 16 April 2015. ^ a b c Brown, Charles Brockden (2009) [1793–1799]. Barnard, Philip; Shapiro, Stephen (eds.). Charles Brockden Brown's Wieland, Ormond, Arthur Mervyn, and Edgar Huntly. Hackett Publishing. p. 360. ISBN 9781624662034. Retrieved 17 April 2015. ^ Rey, Alain, ed. (1992). Dictionnaire historique de la langue française (in French). Dictionnaires Le Robert. ISBN 978-2321000679. ^ Furet, François; Ozouf, Mona (2007). Dictionnaire critique de la Révolution française: Idées. Champs (in French). 267. Paris: Flammarion. p. 243. ISBN 978-2081202955. ^ See also: Furet, François (1989) . "Jacobinism". In Furet, François; Ozouf, Mona (eds.). A Critical Dictionary of the French Revolution [Dictionnaire critique de la révolution française]. Translated by Goldhammer, Arthur. Cambridge, Massachusetts: Harvard University Press. p. 710. ISBN 9780674177284. Retrieved 17 February 2019. The semantic elasticity of the term in late twentieth-century French politics attests to the work of time. 'Jacobinism' or 'Jacobin' can now refer to a wide range of predilections: indivisible national sovereignty, a state role in the transformation of society, centralization of the government and bureaucracy, equality among citizens guaranteed by uniformity of the law, regeneration through education in republican schools, or simply an anxious concern for national independence. This vague range of meanings is still dominated, however, by he central figure of a sovereign and indivisible public authority with power over civil society [...]. ^ a b Phillips, Walter Alison (1911). "Jacobins, The". In Chisolm, Hugh (ed.). Encyclopædia Britannica. 15 (11th ed.). Cambridge: Cambridge University Press. Retrieved 16 April 2015. ^ "World History: The Modern Era". Worldhistory.abc-clio.com. Retrieved 11 August 2012. ^ a b Shariatmadari, David (27 January 2015). "Is it time to stop using the word 'terrorist'?". the Guardian. Retrieved 8 July 2017. ^ "Historic Figures: Maximilien Robespierre (1758–1794)". BBC. Retrieved 18 August 2011. ^ 1911 Encyclopædia Britannica/Fouché, Joseph, Duke of Otranto. Retrieved 28 June 2017. ^ a b 1911 Encyclopædia Britannica/Billaud-Varenne, Jacques Nicolas. Retrieved 28 June 2017. ^ a b "Georges Danton profile". Britannica.com. Retrieved 30 June 2017. ^ 1911 Encyclopædia Britannica/Barère de Vieuzac, Bertrand. Retrieved 7 July 2017. ^ 1911 Encyclopædia Britannica/Hébert, Jacques René. Retrieved 29 June 2017. ^ 1911 Encyclopædia Britannica/Couthon, Georges. Retrieved 28 June 2017. ^ 1911 Encyclopædia Britannica/Collot d'Herbois, Jean Marie. Retrieved 28 June 2017. ^ Thompson 1988, p. 174. ^ "Reign of Terror". Encyclopædia Britannica (2015). Retrieved 19 April 2017. ^ 'Principal Dates and Time Line of the French Revolution'. marxists.org. Retrieved 21 April 2017. ^ Schama 1989, p. 851. ^ Haydon, Colin; Doyle, William, eds. (2006). Robespierre. New York: Cambridge University Press. pp. 260–61. ISBN 978-0521026055. Retrieved 19 April 2015. ^ a b "Modern History Sourcebook: Maximilien Robespierre: Justification of the Use of Terror". Internet Modern History Sourcebook. Retrieved 25 July 2012. ^ Schama 1989, p. 279. ^ Schama 1989, p. 475. ^ Redfern, Nick (14 March 2017). Secret Societies: The Complete Guide to Histories, Rites, and Rituals. Visible Ink Press. ISBN 9781578596461. ^ Alger, John Goldworth (1894). Glimpses of the French Revolution: Myths, Ideals, and Realities. Sampson Low, Marston & Company. p. 144. Retrieved 23 April 2015. ^ Schama 1989, p. 354. ^ Brinton, Crane (2011) . The Jacobins: An Essay in the New History. Transaction Publishers. pp. 212–213. ISBN 9781412848107. Retrieved 16 April 2015. ^ Gottschalk, Louis R. (1929). The Era of the French Revolution (1715–1815). Houghton Mifflin Company. pp. 258–259. This article incorporates text from a publication now in the public domain: Phillips, Walter Alison (1911). "Jacobins, The". In Chisholm, Hugh (ed.). Encyclopædia Britannica. 15 (11th ed.). Cambridge University Press. pp. 117–119. Schama, Simon (1989). Citizens: A Chronicle of the French Revolution. Knopf. ISBN 0-394-55948-7. Brinton, Crane (1930). The Jacobins: An Essay in the New History. Transaction Publishers (published 2011). Desan, Suzanne. "'Constitutional Amazons': Jacobin Women's Clubs in the French Revolution." in Re-creating Authority in Revolutionary France ed. Bryant T. Ragan, Jr., and Elizabeth Williams. (Rutgers UP, 1992). Harrison, Paul R. The Jacobin Republic Under Fire: The Federalist Revolt in the French Revolution (2012) excerpt and text search. Higonnet, Patrice L.-R. Goodness beyond Virtue: Jacobins during the French Revolution (1998) excerpt and text search. Stewart, John Hall, ed. (1951). A documentary survey of the French Revolution. New York: Macmillan. pp. 454–538. Retrieved 16 April 2015.